A very pretty Mallard hen showing off her stuff. She’s a beauty and she knows it! This entry was posted on 2015/03/05 by Robin. It was filed under Birds and was tagged with B.C., Duck, hen, Ladner, Mallard, Reifel Migratory Bird Sanctuary. Love her expression. Such a great capture, Robin. Pat, thanks! I Thought she looked quite pleased with herself! Gorgeous! I had never before noticed the green bill. Ruth, thanks! Me neither. It may be the light. She was tucked away in all those logs and things! 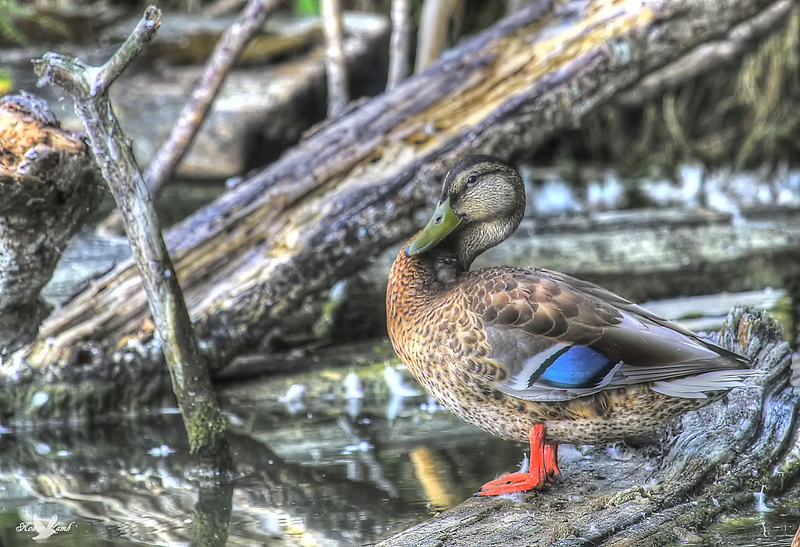 Excellent photo of Mallard hen. Yes, you have captured a great ‘expression’ on this guy, and his coloring is beautiful.